Grandma Bonnie's Closet: Free Two-Week Trial Offer for Reading Eggs! Free Two-Week Trial Offer for Reading Eggs! 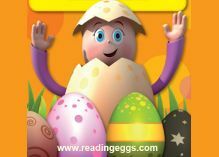 Get a Free Two-Week Trial Offer for Reading Eggs! What is Reading Eggs? It is is a reading program developed by an experienced team of teachers and educational writers. The program is suitable for children aged 3 through 12. Reading Eggs began its journey in 2011. Since then the program has presented more than 15 million lessons in North America. Readers at Grandma Bonnie's Closet can now sign up for a Free Two-Week Trial Offer. Register now to start your child's online reading adventure. I wonder if my son is a little too young. He is a young 3 but I might just try and see how it goes. Thanks! My Grandson is 3 and loves to read. They found out he might need to get glasses. Poor little guy tries so hard to read and doesn't see well.